This week I rested my leg. I also took warm baths because heat helps me more than cold does. And I stretched and did some hip & glute strengthening exercises. On Tuesday, I ventured onto my treadmill for a very easy 2 miles with no incline to see how I fared. My iFit subscription expired and I couldn't find a promotion for 50% off. I don't really want to pay the full price of $144 a year, so I controlled the treadmill myself. 5 minutes light jog and 1 minute walking recovery. I had no issues during that run. View from the trail toward the road/entrance. 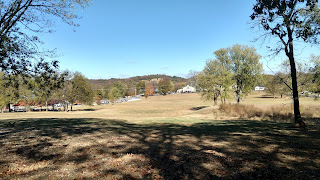 Wednesday, I had errands in Thompsons Station, so I went to the local park. They have a great hill and trail in the back of the park, but since I was on a recovery run, I opted to stay on the crushed gravel loop. That loop is advertised as about 1 mile, but it's really only 9/10ths of a mile. Still, it's an interesting run with a small amount of elevation and lots to observe while running. I ran 5 minutes, walked 1 minute again and ended up with 5 miles at an average of 13:46/mi. 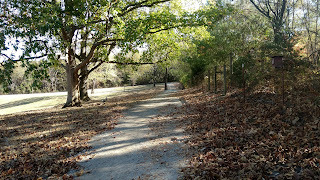 Part of the beautiful trail. I did have a small amount of uncomfortableness the next day, not really in the same place as my previous issue. But I decided to take the rest of the week off anyway and just continue with the therapy. This coming week was supposed to be a step back week anyway, with reduced mileage. I'm going to try to return to regular work, but I'm going to replace my tempo run with an easy run of the same distance.